Taxi Holl invests in new fleet and thereby reduce the annual CO2 emissions by 9,7 Tons! 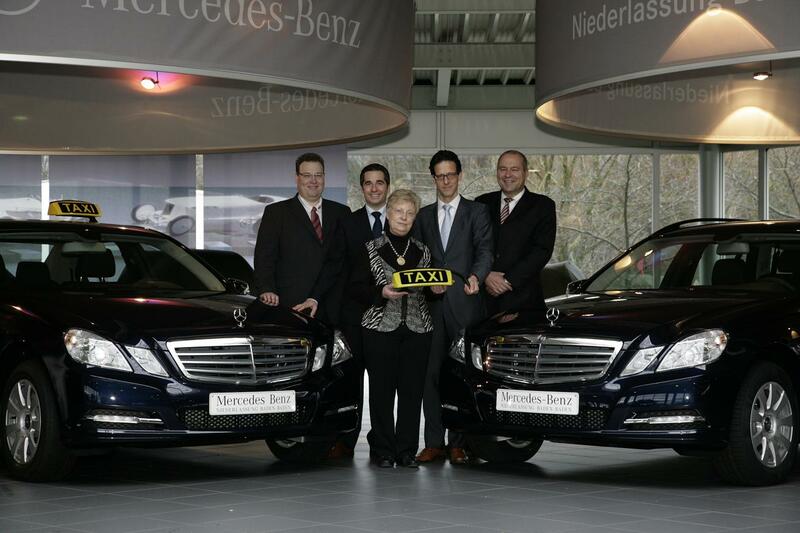 The largest taxi company in the district of Rastatt takes eight brand-new Mercedes-Benz taxis. Taxis are the best for the group Holl is good enough: The readers of the journal "taxi today" to the "Taxi of the Year" crowned Mercedes-Benz E-Class models in the current series W 212 are now in the family of the taxi operation Holl used. Baden-Baden Right at the beginning of taxi Holl has once again invested in the quality of its fleet and purchased " The Taxi" by the Mercedes- Benz dealership in Baden-Baden eight brand-new special models. The decision to station wagons and sedans in the current E-Class series is the nationally operating taxi companies targeted on the winner of the election as "Taxi of the Year" journal "taxi today" in the category “Taxi-Limousine, Wagon and MPV”. "Five vehicles are operating within our part of Baden-Baden to use, so that we are there for our entire fleet only 20 Replace the entire month ", Holl says plant manager Dirk. Another three Mercedes taxis are used in the Murg Valley. “The integrated start-stop system and the currently unbeatable price-performance ratio of the taxi-based vehicles from Mercedes-Benz have finally made the purchase decision easy” so Sebastian Holl, the Director of Engineering responsible for the fleet is. The Mercedes-Benz dealership in Baden-Baden is also very happy, Holl won with a traditional taxi business as customers have. "We are pleased, that taxi-Holl now almost exclusively with the Mercedes taxis on the way and continue the good cooperation in the service area ", Pauli says Jürgen, New Car Sales Director at the office. With the purchase of vehicles, the family could pursue her Holl business objective continues: "We want to continuously reduce CO2 emissions. The vehicles now come with acquired 134 g / km or. 140 g / km between 15 and 19 Grams of pollutants from less than our previously used models. Because of our high mileage we achieve alone, a total annual savings of nearly 10 Tonnen CO2 ", calculates owner Edeltraud Holl. The taxi company Holl Holl is Edeltraud 2012 40 Years to work in the passenger transport. Since 2009 Taxi Holl is also in Baden-Baden with its own branch with five vehicles and 10 Employees at the telephone number (07221) 55 5 55 represent. Taxi-Holl Edeltraud Holl e. Kfr. We will gladly arrange an interview or provide you with further information and images. We are very, if you keep us up to date on publications. For online texts is enough for us a link, otherwise please send a copy, a scan, a PDF or broadcast live recording.